Full STEAM Ahead: St. Rose is going FULL STEAM AHEAD! St. Rose is going FULL STEAM AHEAD! 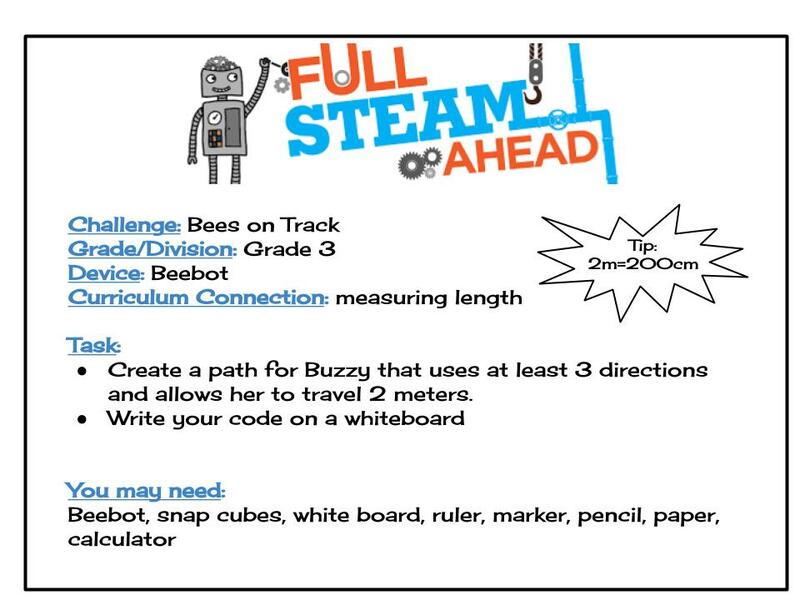 Staff and students at St. Rose Catholic Elementary School in Windsor, Ontario are excited to go FULL STEAM AHEAD in 2017/2018. After applying and being accepted for a TLLP (Teacher Learning and Leadership Program), teachers have committed to identifying and sharing ways that they are embedding coding and robotics into their classroom curriculum. Teachers will be embedding the Scratch Coding app, Beebots, Dash & Dot Robots, and Makey Makey kits into their curriculum and sharing their experiences and task cards for each activity on this blog. Students in Mrs. Sidi's Grade 3 class began experimenting with length using Beebots. Students were instantly engaged as they worked collaboratively to determine how far the Beebot travelled with each move began building their track. Click HERE to access the Bees on Track Task Card. Please feel free to "make a copy" and make it your own. We would love for you to share your version back with us in the comments below. Each group tackled the challenge in a slightly different way. Groups shared their thinking on paper and recorded their code on THIS WORKSHEET prior to programming Buzzy. Once students calculated the distance travelled by a single command, they applied their understanding of multiplication and addition to create the right size track for the challenge. They were eager to make variations of the track and include tunnels and additional turns. The students worked collaboratively to write and debug their code to complete the challenge. ** This activity could also be run using Dash (Wonder Workshop) and Sphero.